3CE (3 Concept Eyes) is a Korean makeup brand, that has an aesthetic similar to that of MAC - not too expensive, quirky, colourful, and of high quality. 3CE has gotten quite a cult following here in Asia, so I've been slowly building up my little hoard of 3CE items. 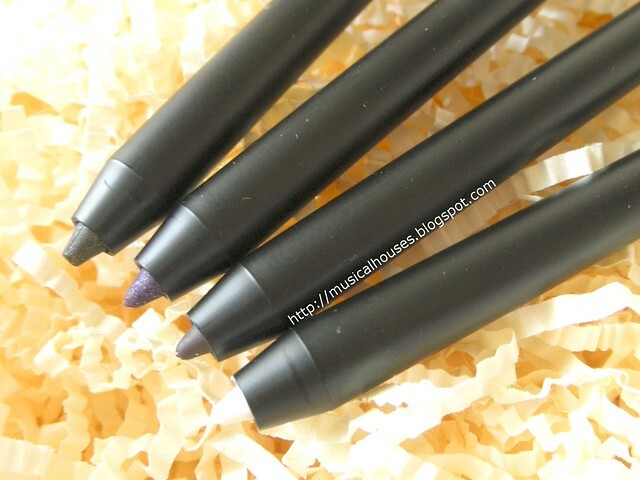 3CE's Creamy Waterproof Eyeliner Pencils are one of the things I've been buying, and after amassing 4 shades, I thought it's fair enough for me to give a review on their pencil eyeliners! 3CE has, of course, more than just eyeliners - like MAC, their range of products spans from lipsticks to eyeshadows to foundations to base products to lip tints and the like. 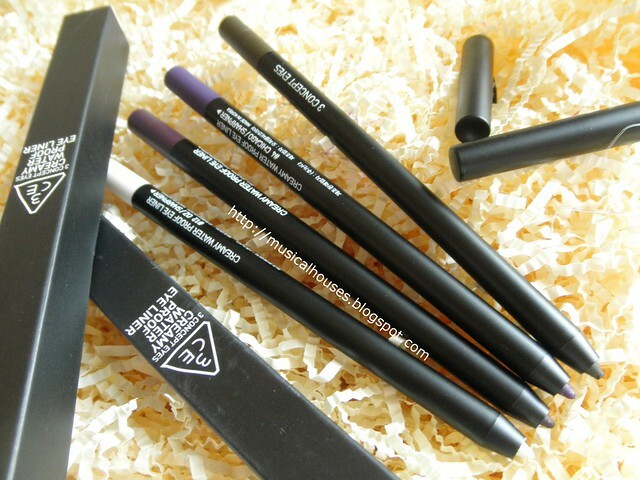 I've been reading great things about their eyeliners (along with the entire brand in general), which is why I thought these would be a good place to start. So, without further ado, let's get started! In addition to swatches, I've also done some tests to see how long-lasting the eyeliners are, so this will be a bit of a long-ish review, but I hope it's worth it! 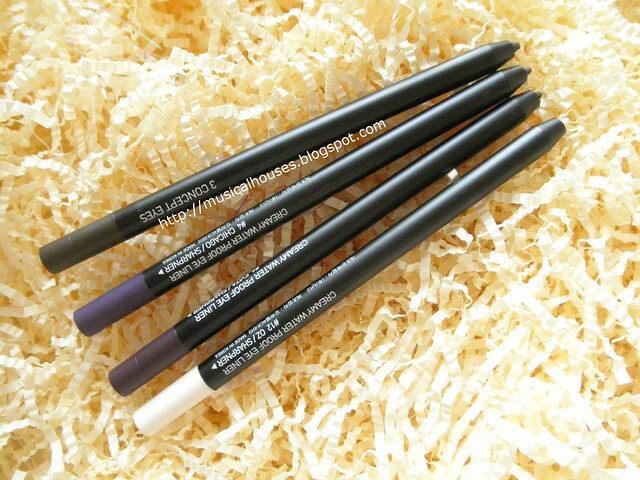 The 3CE Creamy Waterproof Eye Liner Pencils are long and slim, like your typical eyeliner pencil, and they all have black pencil barrels, except for a little bit at the end that matches the colour inside the barrel. 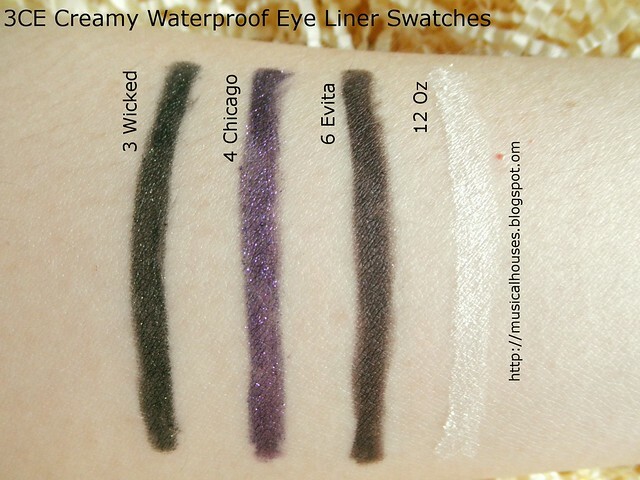 The four shades I have are #3 Wicked, #4 Chicago, #6 Evita, and #12 Oz. I like that there's a little sharpener at the end of the pencils that also matches the pencil colour. Not that you'd really need this because the eyeliner pencil itself is retractable, but I guess if you want to sharpen that tip to a fine point, you can! The 3CE Creamy Waterproof Eye Liners have various finishes - there are the creamy kinds, some with shimmer, and some with glitter, and so on. You can see the glitter in the tips of the more shimmery colours! Anyway, without further ado, here are swatches! All of the shades have great pigmentation and glided on really smoothly, except #12, which was a bit sheer and needed some work to show up. #3 Wicked is a deep olive green shade, and has a shimmery finish but not much discrete glitter. #4 Chicago is a glittery purple, with discrete glittery goodness. #6 Evita is a blackened eggplant shade, a great alternative to black. This is a creamy finish sans glitter and shimmer. #12 Oz is a shimmery, glittery white. It is a good shade for the waterline or inner corners of the eye. 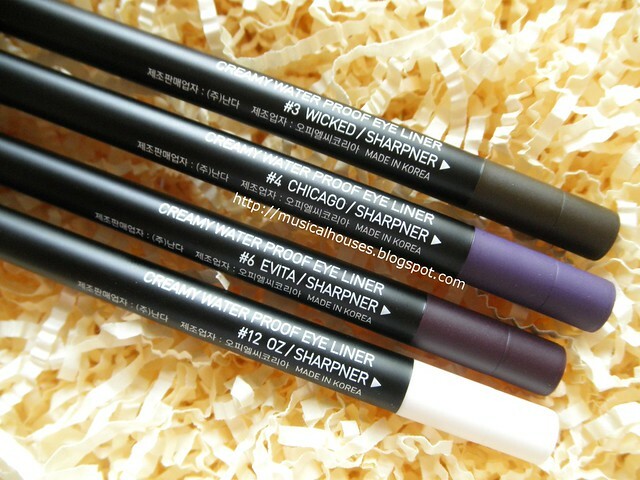 Now, let's put the various eyeliners through my usual eyeliner tests! First up, there's the smudge test. I basically let the swatches "set" for a few minutes, and then I rub the swatches with my finger to see if they smudge. 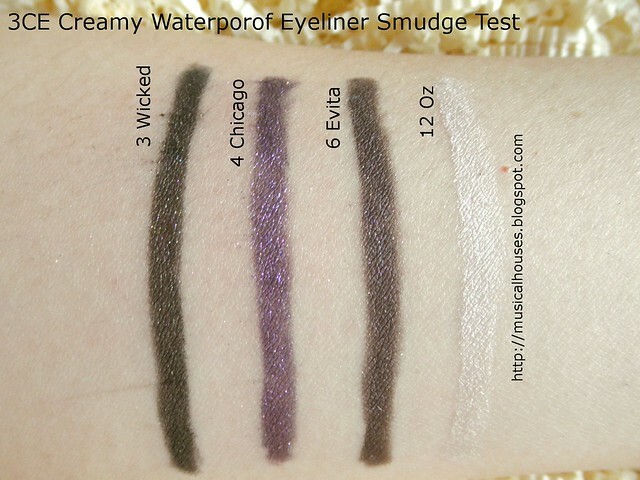 From this set of swatches, you can see that they don't smudge very much at all! These are indeed smudgeproof. Now, for the waterproof test. These were put under a running tap to see if they dissolved off. Once again, you can see that the water didn't cause them to smudge or dissolve or run at all! 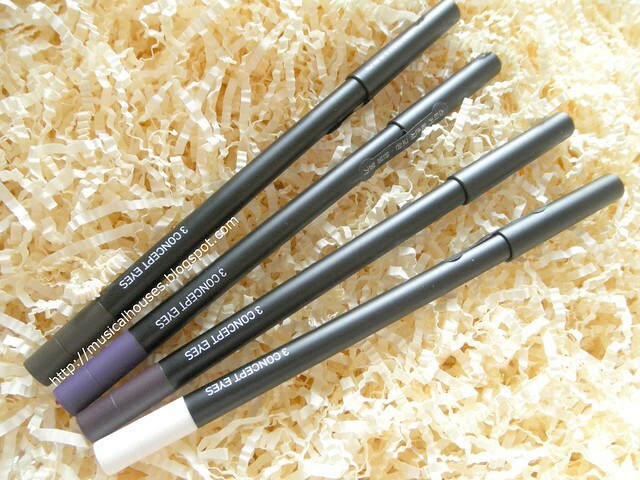 So yes, these are indeed waterproof eyeliners as the name claims! 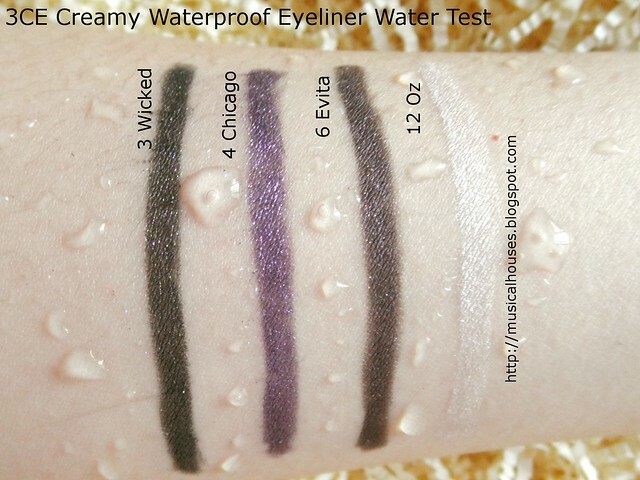 Lastly, we have the waterproof and smudge test. Basically, I smudge the swatches with my finger while they are under a running tap. This is a killer and usually wipes off most of the eyeliners I've reviewed, but you can see the 3CE Creamy Waterproof Eye Liners have really stayed on. I have to say, I'm impressed! Some of the waterproof eyeliners I've encountered don't dissolve or run, but may flake off, but these have stayed on pretty well! And, here are some comparison swatches! Evidently I like to buy too many of the same shades - I guess olive greens and purples are popular eyeliner choices for me! Urban Decay Rockstar and 3CE #6 Evita are quite similar. I feel like #6 Evita might be a bit more blackened than Rockstar, and Rockstar is shimmery, but I don't think I could really discern that much difference between the two. In terms of pigmentation, smoothness, and quality, both are on par for me. 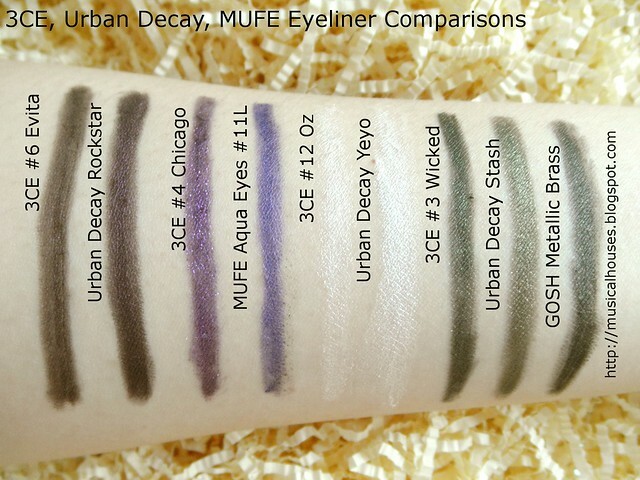 urban Decay Yeyo and 3CE #12 Oz are similar, except that Yeyo goes on much smoother, and with mmuch more pigment. Otherwise, the two are virtually identical in that they are both shimmery whites - although I do think Yeyo is a bit more of a snow white shade, and #12 Oz i a bit more of a ivory white kinda shade. I definitely prefer Urban Decay to 3CE in this particular instance, just because it's smoother and more pigmented. 3CE #3 Wicked is similar to two other shades in my eyeliner stash, GOSH Velvet Touch Eyeliner Pencil in Metallic Brass (more shades of the GOSH Velvet Touch Eyeliners were swatched previously on my blog) and Urban Decay's Stash eyeliner, although none of them are identical. GOSH Metallic Brass is blackened and deeper and a little more forest green than olive green, while Urban Decay Stash has a more metallic finish that is slightly more interesting to the eye - it has this gold shimmer in it that makes it stand out a bit more unique to my eye. Still, I'm not sure if I would be able to tell them apart on my eyes when worn. 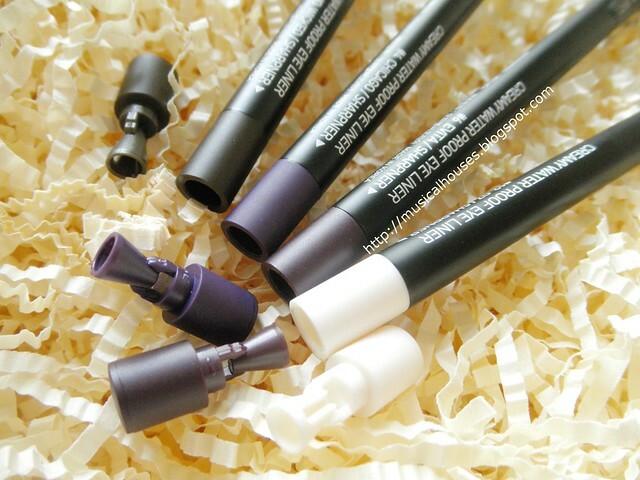 3CE Creamy Waterprof Eye Liner: Definitely a recommended buy all around! 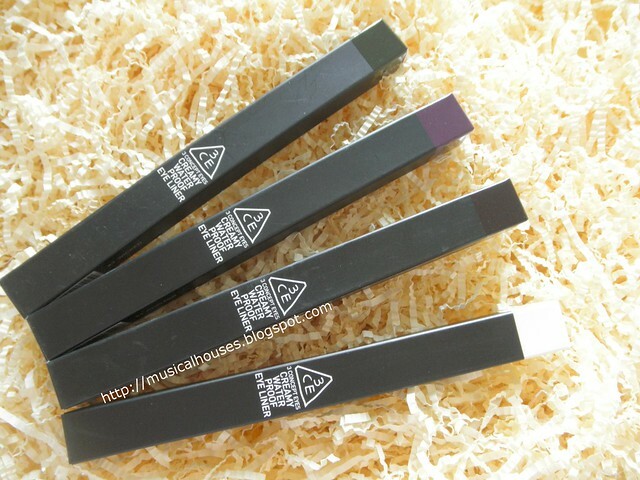 So, would I recommend these eyeliners? Definitely! These are highly pigmented, very smooth, and overall great quality comparable to higher end brands like Urban Decay and the like. And at US$14 (on the 3CE website) they are not too expensive either (locally, we have Luxola which carries them - but Luxola is rather overpriced at SGD$21 so if you're ordering from there it's probably better to wait until there's a sale or a discount code). 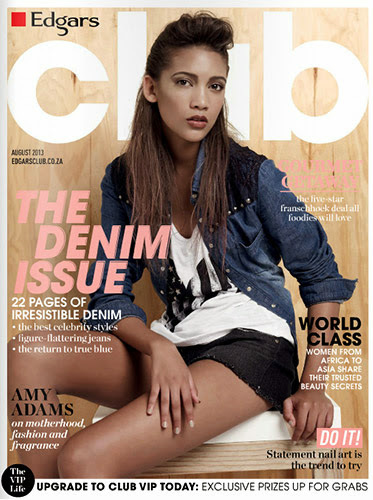 All in all, I think these are definitely worth checking out. The Bottom Line: Smooth, pigmented, and long-lasting, the 3CE Creamy Waterproof Eye Liners are great quality at a price that doesn't break the bank. I love 3CE. The beauty looks on the Stylenanda site are so on point and inspire me to experiment with my looks as well. 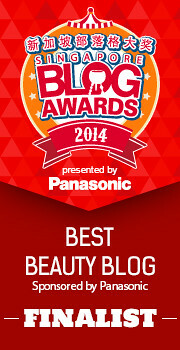 I've tried their eyeshadows, an eyeshadow stick and their lipsticks. I love the lipsticks the most.. 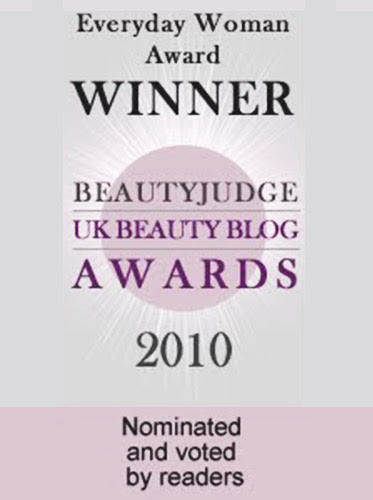 They were the first products to earn my first rave review on my blog. have you try to put it in the waterline ? if yes, is it hold all day long ? 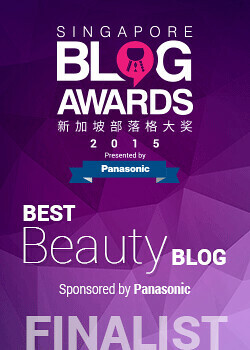 @Cintami Andoko: I've never tried it on my waterline becsuse in general I don't put eyeliner there. When I apply on my own eyes at the lashline it is fine. 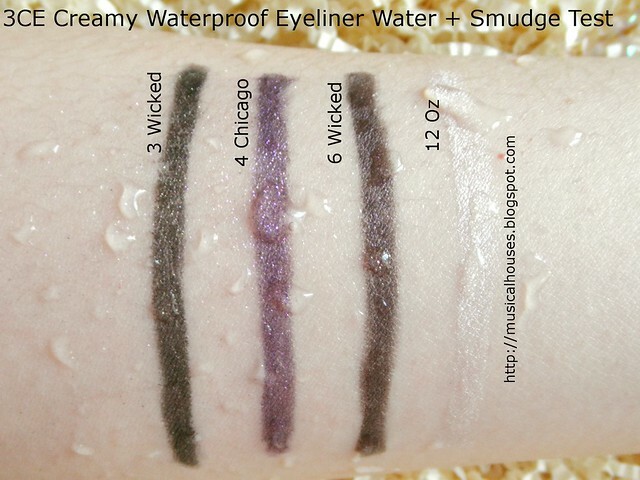 But waterline is more "wet" than the lashline so I'm not too sure how it will hold up there! I still haven't tried 3CE yet, but I really want to!! I love 3CE eyeliners! They are my HG, next to MUFE eyeliners. Thanks for the great posts! They looks really good! Definitely might think about trying them. ^^ Thanks for the review!